French photographer Henri Cartier-Bresson (1908-2004) is considered to be the father of photojournalism. He mastered the art of candid photography and an early adopter of 35 mm film. Inspired by Hungarian photojournalist Martin Munkacsi’s 1930 photograph Three Boys at Lake Tanganyika, he took to the streets of Paris, Berlin, Brussels, Warsaw, Prague, Budapest and Madrid and was instrumental in developing the art of street photography or life reportage style. 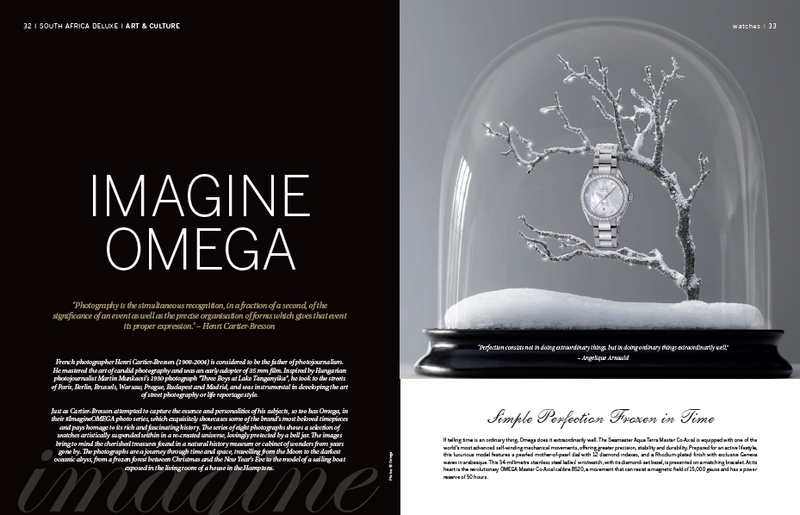 Just as Cartier-Bresson attempted to capture the essence and personalities of his subjects, so too has Omega, in their #ImagineOMEGA photo series, which exquisitely showcases some of the brands most beloved timepieces and pays homage to the rich and fascinating history of the brand. The series of eight photographs shows the watch artistically suspended within in its re-created universe, lovingly protected by a bell jar. The images bring to mind the cherished treasures found in a natural history museum or cabinet of wonder from years gone by. The photographs are a journey through time and space, travelling from the Moon to the darkest oceanic abyss, from a frozen forest between Christmas and the New Year’s Eve to the model of a sailing boat exposed in the living room of a house in the Hamptons.